C.S. Hassler, V. Schoemann, M. Boye, A. Tagliabue, Rozmarynowycz M, McKay, RML. Iron Bioavailability in the Southern Ocean. In: Oceanography and Marine Biology: An Annual Review. (eds) Gibson RN, Atkinson RJA, Gordon JDM, Hughes RN. CRC Press, London, 2012, 50, 1–64. Hassler C.S., van den Berg C., Boyd P.W. Using a regional classification to provide a more inclusive examination of the ocean biogeochemistry of iron-binding ligands. Frontiers in Marine Sciences. https://doi.org/10.3389/fmars.2017.00019. 2017. Hoppe C.J.M., Hassler C.S., Payne C.D., Tortell P., Rost B., Trimborn S. Iron limitation modulates ocean acidification effects on Southern Ocean phytoplankton communities. PLOS ONE. DOI 10.1371/journal.pone.0079890. 2013. Hassler C.S., Legiret F.-E., Butler, E.C.V. Measurement of iron chemical speciation in seawater at 4⁰C: the use of competitive ligand exchange – adsorptive cathodic stripping voltammetry. Marine Chemistry.149: 63-73. 2013. Cropp, R.A., A.J. Gabric, M. Levasseur, G.H. McTainsh, A. Bowie, C.S. Hassler, C.S. Law,H.A. McGowan, N. Tindale, R.A. Viscarra Rossel. The likelihood of observing dust-stimulated phytoplankton growth in waters proximal to the Australian continent. Journal of Marine Systems. 117-118: 43-52. 2013. C.S. Hassler, V. Schoemann, C.A.M. Nichols, E.C.V. Butler, P.W. Boyd. Saccharides enhance iron bioavailability to Southern Ocean phytoplankton. Proceedings of the National Academy of Sciences. 108: 1076-1081. 2011. I. Worms, D. Simon, C.S. Hassler and K.J. Wilkinson. Bioavailability of trace metals to aquatic microorganisms: Importance of chemical, biological and physical processes on biouptake. Biochimie, 88: 1721-1731. 2006. C.S. Hassler and M.R. Twiss. Bioavailability of iron sensed by a phytoplanktonic Fe-bioreporter. Environ. Sci. Technol. 40 :2544-2551. 2006. Biodiversity and isolation of bacteria and viruses in contrasted regions of the Southern Ocean. 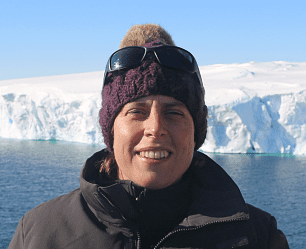 Antarctic Circumnavigation Expedition (ACE) funded by the Swiss Polar Institute.